First, the reason for the promotion. Kroger is having a huge sale and in addition to giving me a $25 gift card (via MyBlogSpark), they're also giving one of you a $25 gift card. Woo! 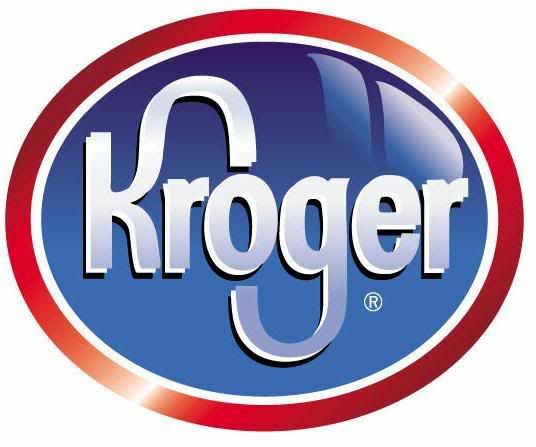 Keep in mind that if you don't have a Kroger, there are other chains in the "family" that it can be used at. Through March 14th, shop the Cart Buster Savings Event and find the hottest prices around on your favorite name-brand products in over 60 categories at the Kroger Family of Stores, which includes Kroger, Ralph´s, King Soopers, City Market, Dillons, Smith´s, Fry´s, QFC, Baker´s, Owen´s, Jay C Food Stores, Hilander, Gerbes, Food4Less, Pay Less Super Markets and Scott´s Food & Pharmacy. Here are just a few of the great brands participating in the event: Honey Nut Cheerios, Cinnamon Toast Crunch, Pillsbury, Betty Crocker, Hamburger Helper, Yoplait, Progresso, Totino´s, Green Giant, Cascadian Farm, Tide, Charmin, Bounty, Pampers, Pantene, Crest, Iams, Febreze, Old Spice and many more! Now this particular sale ends in just a couple days, so you'll have to hit up your local store soon to take advantage of it. If you win the gift card, you'll be able to use it for some of their great sales in the future....and there are 'always' sales going on. Anyway, here's how to get your chance to win one, too. I tend to stock up on diet coke and bottled water when they go on sale! I'd like to stock up on Tide, frozen veggies and Cheerios. following you on twitter @bellows22 and i tweeted! I love stocking up on shampoo, soap, and laundry detergent when there are sales! I was fortunate at the end of summer last year to go to Justice (clothing store for girls and I have two of them) with a 40% off coupon and bought $32 bathing suits for $5.99. I also purchased most of my kids spring/summer wardrobes for this year during that sale... SCORE! I follow you on twitter (WendiP) and tweeted, thanks! #2 tweet today, Thanks Again!!! The best sale I ever caught was at off sak's 3 years ago. I found a pair of Christian Leboutin shoes for $50!! I shop at Krogers all the time. I actually just went to Krogers today and stocked up on their Annie's mac 'n' cheese for .49 a box! I doubt I'll see it that cheap again! I am following you by e-mail and I would stock up on ceral if I had the chance. I like to stock up on toilet paper. We seem to stock up on on body wash and shampoo. Recently we stocked up on cereal and pop tarts. I stocked up on fruit snacks during this sale. It might sound crazy but I love stocking up on apple juice. That way if, by the end of the day, I feel my daughter hasn't had enough of her fruits I'll pop her a glass and feel better about her vit. intake! I like to stock up on swiffer products; they're great for easy cleaning. I subscribed via email to Quirky Jessi. I subscribed to Quirky Cookery via email. I would like to stock up on cheerios. I added your giveaway to the doubleprizes site. i always love to stock up on cereal... my husband thinks it is a foodgroup! I stock up on paper towels and toliet paper when there's a good sale. They'll never go bad! I stock up on laundry and dishwasher detergent when there's a good sale! My best stock up items are diapers and cereal. One time I got several hundred pictures plus a photo book FREE by combining promotions and coupons! It was wonderful! I once stumbled across a sale of 12 packs of coke. It was 4 cases for $10 with one free and happened to have a coupon for $2 off if you buy over 3. I left with a lot of coke! I have over 30 tubes of toothpaste! I love it when I can stock up on cereal. We use a lot of cereal!!! left a comment on Quirky Cookery post about oranges charging I-Phones. two best deal ever had were 1.99 off any size pull up so i was able to get them free on the sample size packs because they had 1.99 coupon inside the 1.99 pack but they had 2 coupons in them. one in french and one in english so I was getting 2 packs for every one pack. they started just giving them to me by the cases. i would give them to friends and homeless and the poor shelters. 2nd was when my husbands grandmother 2 96 yrs old was sick and she could only eat baby food. I found a deal were there was an earths best $1.00 of 5 and shoprite was running a special 5/1.25 so I was getting 5 of the small jars for 25 cents so they were a nickel a jar. I got 57 cases. these offers were both back a few years ago. I stock up on cereal, diapers, and pasta! Thanks for the giveaway! We stock up on cat food and laundry detergent when there is a sale. I commented on the six cans of jalapenos post on Quirky Cookery Blog. I like to really stock up on canned vegetables when I find a really good sale. The best deal I have gotten lately was buying 1 package of Lifesavers on sale for 99 cents, and finding a coupon insided for 50 cents off. I used the coupon for another pack (which got doubled)....did this a few times over the next couple days. I ended up paying 99 cents for 6 bags of Lifesavers. I like to stock up on Progresso soups, yogurt and cereals during sales. I stock up on organic beans when I find them on sale. They are great to have in the pantry. My favorite thing to stock up on is diapers! The best sale I've ever experienced was a Kroger 10 for $10 sale that I had lots of coupons for. I saved over 50% off with coupons, and since the prices were so low, I saved even more. The best deals I found lately was last year. All the Targets and Walgreens in my area were doing resets and were marking things down like crazy. I stocked up on tons of things like paper towels, toys, tissues, paper plates,cereal to name just a few. I love to stock up on paper towels & napkins! We go through them super fast. I subscribe to Quirky Jessi w/Google Reader. I love to stock up on organic/natural products when they go on sale because that is what I eat and it is normally quite pricey! I subscribe to emails from Quirky Cookery. I subscribe to google reader for Quirky Cookery. I have a kitty with hyperthyroidism and we give him lots of treats each day for added calories, so I stock up anytime I see cat treats on sale!